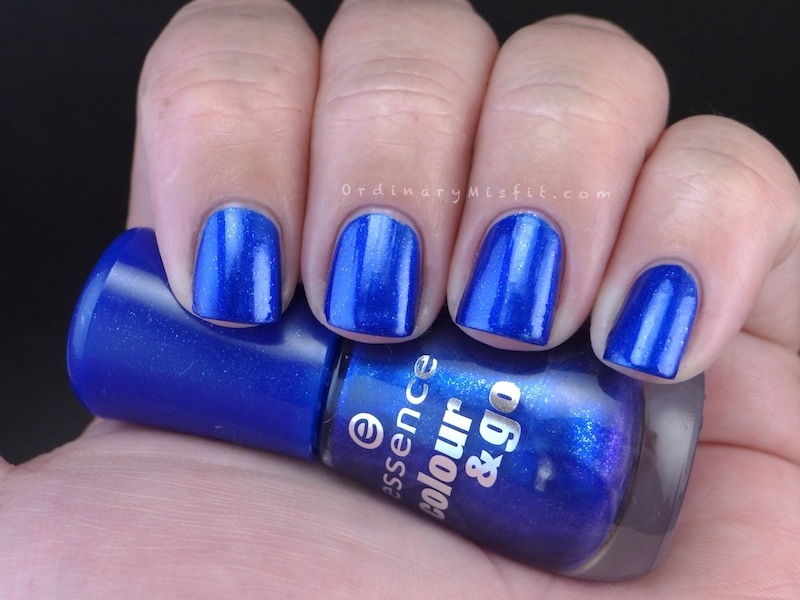 A few weeks ago I posted on instagram about an Essence polish that was a different shade on the shelf than the one I had at home. I got feedback pretty quick that some of the colours from the Colour & Go range have been ‘updated’ and slightly altered. I thought this was really strange practice but what do I know right? The colour I saw was definitely different but I I didn’t pick it up at the time so I can’t show it to you unfortunately. While browsing last week I noticed a polish on the shelf that I had not seen before. It’s was gorgeous and shimmery so I knew I was probably going to walk out of the shop with it. I picked it up and looked at the name and it was so familiar. I was so sure I had that shade but I didn’t recall the colour at all. So I popped onto my phone to check if I had it and I did. Looking at the swatch I realised it was a different colour for sure. Knowing it must be another colour update, I snatched it up immediately. It was so gorgeous anyway. So enough babbling from me. Should I just show you? Isn’t it pretty? I definitely think the ‘updated’ colour is gorgeous but I did like the ‘old’ shade as well. I just don’t understand why they couldn’t keep both? Anyway, both of these are two coats each and no topcoat. It is very clear that they are different but let’s look at them together shall we? So there you can clearly see the difference. 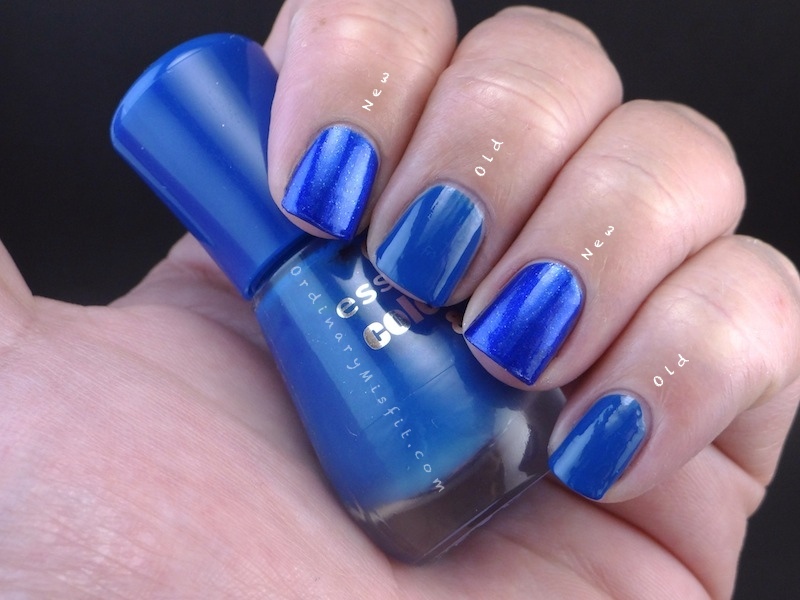 The old shade is a blue creme and the new shade is a blue shimmer. Both of them are really pretty in my opinion and quite honestly, I think the range could’ve used both. What do you think? Do you have a preference between the old and the new shade? Does it make sense to you that they would ‘update’ their existing colours? I think the new shade is absolutely gorgeous but I do still like the old shade as well. I would love to hear what you think! I loooove the new version. Totally gorgeous and shimmery. Thanks Lynette. I completely agree. The new one is gorgeous! Thanks Loren. I completely agree. The new one is gorgeous. When I was with the Cosmetix Interns I pointed out that there was a difference between them and they hadnt even noticed there was lol But I must say I love the new one! New is gorgeous. I liked the old one but the new one is beautiful. I wonder why they don’t just bring it out with a new name? But I also like the new one better anyway. I agree Kerry. I would be happy to have both in the collection. Makes no sense to me. Did they fire the person that names the polishes? Why can’t they give the new colours new names? Out of these two I prefer the new one, buy would probably not have bought either for myself. I love both but to be honest I love the creme a lil more than the shimmer. It’s just a lil more classic. I feel if you’re gona update colours, then update ugly ones. This shade didn’t need an update as it was pretty to begin with. But that’s just me. Brethil Ebontree recently posted…Liebster Award – Yay! I prefer the metallic finish polish way better! It is stunning! Thanks Imka. I also like that a little better. It really is gorgeous. That is interesting! They could have seriously just added the new one to their line under a new name because I really love both! The one with the shuttle shimmer is almost a true inky blue which hits me so hard in the “LOVE!” spot! Awesome post as always M! I agree with you. I think the line could use both but the new one is definitely something special. It is so pretty. I like the newer one more, but I think it is odd that they “update” colors without mentioning it. It would annoy me if I saw a color swatched and went to buy it and then it was something different! I agree with you 100%! Which is why I ended up getting the new one too. I would hate to have people buy something that is different now. It doesn’t really make sense to me at all. I know of 3 colours they have done this with.